Ultimate: It’s Who You Are. I am who I am today because of the sport of Ultimate. Think about how you started playing and why you chose to stick with it over another pastime or sport. I’m willing to bet that if you ask anyone from a weekday league player to a four-time club National Champion, they will tell you that playing Ultimate aided them in shaping who they are. If I were to strike up a conversation with an Ultimate player, I would definitely want to learn three things about them: 1) how they got started, 2) what kept them going, and 3) where they plan to go with it. Their story is usually a summary of their character. The following is my (short) story of how I evolved through Ultimate into who and where I am today. My classic rotation of fall, winter, and spring sports in high school went something like this: tennis, dance team, then lacrosse. Coordination, agility, endurance, and field awareness were skills that came naturally to me the moment I first played Ultimate Frisbee in 2004 at German camp. There were about 14 of us who had little to no experience in the sport, and one other female that signed up. For some reason, this group clicked and despite how terrible we were, we all appreciated the concept of the game. After two weeks of trying to learn German and playing a new found pastime that I loved, I couldn’t wait to share this game with my friends at home. I organized pickup once a week on Fridays after school beginning that fall on a small (maybe the size of two end zones combined) field at a nearby park. Our throwing ability was lacking, so the small field size was just fine. That spring we upgraded to the middle school football field with timer lights. The pickup schedule spread through word of mouth, Facebook groups (side note, this was a time where very few people had Facebook), and text messages (if you had a cell phone). **Side note: I finally get to say things that make me sound old! ** Anyway, every Friday we had a different group of people. It was a really exciting way to connect with people from school through an activity where everyone had similar abilities, no one person stood out. There was no right or wrong, just fun and funny. After the camps, the amateur pickup games that lasted for hours, light-up Frisbee escapades, and laying on the fields until well past curfew, our Ultimate fan-club went our separate ways as we headed to college, myself included. During my first two years at the University of Wisconsin – Eau Claire, I couldn’t quite find myself or figure out what I wanted to do. I fell back on my high school experience and decided to look into collegiate level sports. I went to one pickup Ultimate game as a freshman and showed promise, but at the time I was afraid of change and couldn’t commit to “competitive” anything. Instead, I decided to apply for, and was eventually accepted to, study abroad in Australia my spring semester in 2009. I was hoping this would guide me into my last leg of college and I would come home with a positive experience and crazy memories, clearly knowing where I was going in life. Despite all of this, I still looked forward to coming home every summer and reuniting with anyone who wanted to play pickup. There was just one thing that gradually changed – everyone started to get good and they all had one thing in common: they joined their college Ultimate teams. If I was to continue to keep up with this summer past-time I had to do the same. I told myself I’d play a fall season with SOL, find a league in Australia and play one full year of Ultimate upon my return. However, when I began to get involved, it came along with meeting who are now my life-long friends. I went to pickup, participated in Mixed Mondays (mixed pickup), learned the rules and about spirit-of-the-game, went to my first club and college tournaments, and won my first tournament ever. 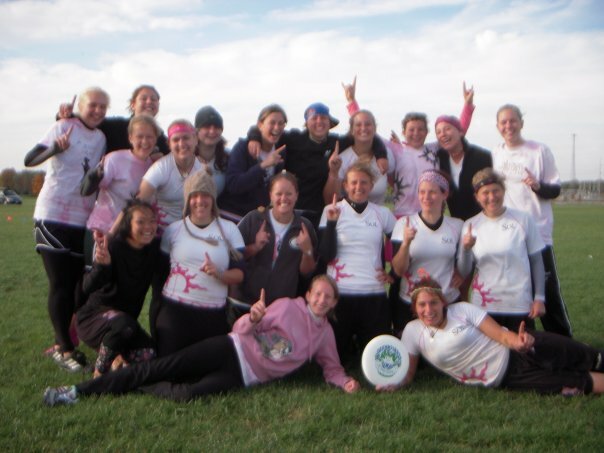 I began to think back to those moments that initially attracted me to Ultimate and remembered that meeting new people and coming together to have fun was why I started playing in the first place, why I came back to it, and why I wanted to stick with it. That feeling was important to me and I couldn’t leave it. I made the tough decision of cancelling my study abroad trip that spring and poured my heart into SOL. Midwest Ultimate, spring break trips, High-Tide, Georgia, Centex, and Regionals for the next two years instilled my craving for practice, strategy, planning and coordination, fundraising, traveling, socialization, and of course, dancing. Think about how you started playing Ultimate and why you chose to stick with it over another pastime. If you played college Ultimate, I’m thinking you have comparable memories that fuel your addiction for this culture. Where are you now, and where will you go? After two years of untouchable memories with SOL, and a dash of club experience with a team called Oh Boy!, I knew I didn’t want this to end after graduation. Four years with Drag’n Thrust and a few pickup/reunion tournaments later, the experience and travel adds up. Yet, I still have to earn my spot on the team every year as that same feeling of determination and perseverance creeps up every spring. I definitely get my Ultimate fill playing with Drag’n: practice, teammates, friends, routine, and challenging goals. I’m not sure where I want to “land” when I come down from this Ultimate-high, but I know I’m still not even close to soaking up everything I can. The greater reward than a National Championship is the memories you’re making along the way, and who you are because of them. While a trophy and medal is the end goal now, it’s the pint glasses, the Frisbees, the sunglasses, the people, and the parties that kept us coming back. We’ve accomplished a lot as a team and I continue to develop as a player. I hope that whatever team you play for you feel the same way. If you only play Ultimate in one league a year, I encourage you to play a second. If you have no Ultimate experience but are a follower or fan, don’t stop. It gives us more support than you know. We can always be better Ultimate players and people and I’ll continue to make Ultimate decisions that justify just that! I still thank my parents to this day for investing $1300 for me to attend German camp, although I have retained nothing except for “Mein fahrrad ist kaputt” (my bicycle is broken). 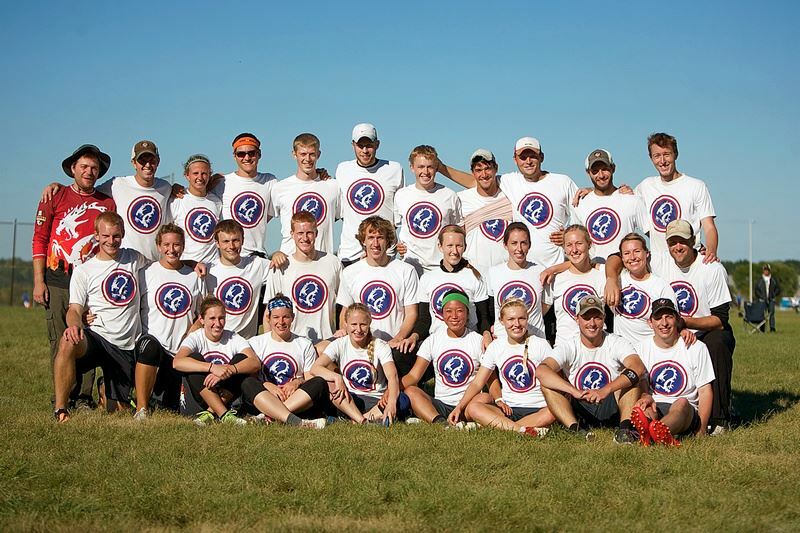 I can’t thank Robyn (Fennig) Wiseman enough for dedicating hours to making me a better Ultimate player, Anna Hettler for encouraging me to make the best decision for myself at the time and stay in Wisconsin, Pat Niles for coaching SOL and supporting my transition from college to club Ultimate with Drag’n Thrust, Austin Lien for being there since day one, and SO many others that have had a positive influence and have supported me along the way. (Oh my gosh I sound like I’ve won some award, but I’m just really thankful). I try to pass along the same time, hope, and encouragement to others that want to go further in their Ultimate career. Maybe you’ve heard more than you care to know about me, and my story obviously leads to many more that I could expand upon for days. My point is that I believe you can do the same. Each of these moments defines why we are the people we are today. All of these relationships and experiences we’ve had add up to this “lens” we view life with. Community, empathy, fun, character and culture is what made me fall in love with Ultimate, and what I look for in every new endeavor. This entry was posted in Drag'n Digest. Bookmark the permalink.